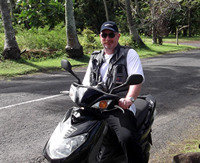 Pacific Cars in Muri Beach, Rarotonga, is a rental firm that TikiTouring has used and will definitely use again. It provides cars, motorscooters and electric bikes and is conveniently located near the major tourism centre of Muri. The staff at Pacific Cars are friendly, super efficient and will make any transaction you have with them a breeze. That comes from the top down as the owners Dave and Sheryl are also great people to deal with. However, on top of the terrific customer service, the team at Pacific Cars offers excellent deals – particularly on week-long rentals. And the vehicles, like the folk looking after them, are top notch. Pacific has more than 10 years of travel industry experience and they offer a wide range of reliable vehicles. On top of that if you run into problems with your hire vehicle they are quick to get you back on the road. We know this as one TikiTouring boss ran the battery flat on a scooter and the Pacific team was there very soon after to ease her embarassment. Good service and good prices – unbeatable combination.